Lewis is the largest of the Outer Hebrides, and its capital Stornoway is by far the largest centre of population. 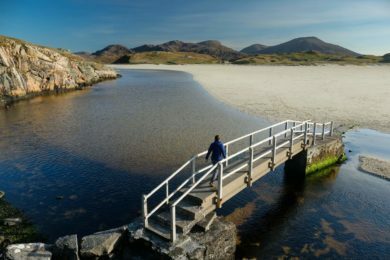 The northern half of the island is flat, bleak peat bogs but fringed by some fine coastal scenery and magnificent beaches, making for some excellent walking around the fringe. Here too are visitor attractions such as the celebrated standing stones of Callanish and the reconstructed blackhouse village at An Gearrannan. The southern half of the island is much more dramatic with remote hill ranges around Uig and the Pairc peninsula. Though the hills are not high, they are extremely rugged and remote and reward their relatively few visitors with remarkable views. Bboard the ferries to visit Scotland’s stunning island beaches on a pictoral journey through the Hebrides, Orkney and Shetland – blessed with some of the very finest beaches in the world.